Orchard Ware by Hazel Atlas Glass Co.
Hazel Atlas made this set around 1950. 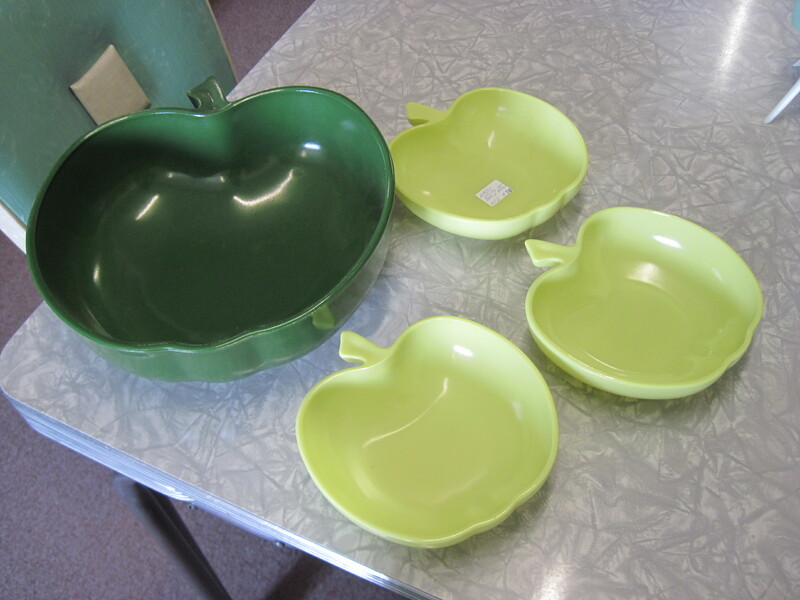 It is part of the Orchard Ware line and shown is a partial salad set with a large dark green 10″ salad bowl and three smaller chartreuse 6″ single serving bowls, in the shape of apples. The colours are fired on a milk glass base. The sets were made in a variety of colours like maroon, turquoise, avocado, rose, black, white, yellow and gray as well as the dark green and chartreuse pictured. There were usually several complementary colours in one set. They also made Apple Snack Sets which consisted of 4 ringed plates and matching cups. Please note these dishes have been SOLD! !